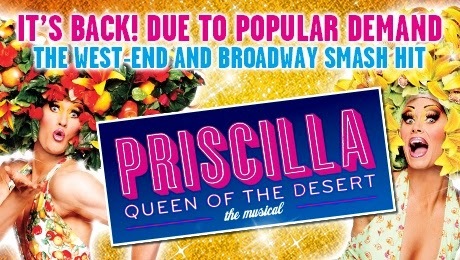 Smash hit PRISCILLA returns to Edinburgh this Christmas! Due to popular demand, the West End and Broadway feel-good international hit sensation PRISCILLA QUEEN OF THE DESERT brings the party to Edinburgh this Christmas. The smash hit musical returns to Edinburgh from 15th December 2015 – 2nd January 2016 before heading to the King’s Theatre Glasgow from 29th March until 2nd April 2016. Get ready for the ride of your life! Based on the movie, PRISCILLA QUEEN OF THE DESERT THE MUSICAL is the heart-warming, uplifting adventure of three friends who hop aboard a battered old bus searching for love and friendship and end up finding more than they could have ever dreamed of. With a dazzling array of outrageous costumes and a hit parade of dancefloor favorites including ‘It’s Raining Men’, ‘Say a Little Prayer’, ‘Go West’, ‘Hot Stuff’ and ‘Always on My Mind’, this wildly fresh and funny new musical is a journey to the heart of FABULOUS! PRISCILLA QUEEN OF THE DESERT THE MUSICAL originally opened in Australia and after a sell-out two year run, opened in London’s West End followed by Broadway in the United States. It has won numerous awards all over the world, including prestigious Olivier and Tony awards.